Home HM LoH PS4 Switch Can I Change Clothes in Harvest Moon: Light of Hope for PS4 and Switch? 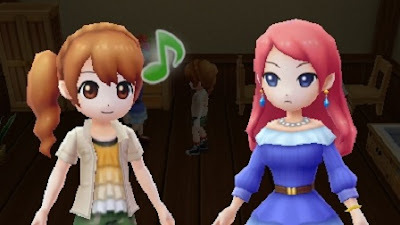 Can I Change Clothes in Harvest Moon: Light of Hope for PS4 and Switch? In Harvest Moon: Skytree Village, you could be able to change outfits via dresser (wardrobe) in your house. There's a total of four outfits and hairstyles, including the default one. So you might be wondering, can we do that too in Harvest Moon: Light of Hope? Is there customization in this game? Your curiosity may come from Melanie. Basically, when you talk to Melanie in LoH, she will say something about using a dresser in your house to change your clothes. Yes, you can do that, you can customize your character outfits and hairstyles! But unfortunately, It's a part of the upcoming DLC, Doc's and Melanie's Special Episodes. Of course, you need to buy the DLC first to unlock it. Natsume has revealed the details of the DLC on their website. Release Date: July 10th, 2018.
designing slump, and needs your help for inspiration! Meanwhile, Doc is having trouble in the romance department! Can you help him out? And what rewards will they give you? From there, it can be concluded that there will be 2 new shops open the business. For now, I don't know the other one. When you managed to help and complete Melani's quest, you will unlock a new boutique shop and the dresser to change your clothes. To unlock more hairstyles and clothes that Melanie sells, you need to complete her requests. Don't worry, most of her requests are easy to complete because it only requires animal products, especially wools and donkey furs. Updated on July 11th, 2018: The DLC is available now! We will update this article or maybe make another post soon once we figure out how it actually works. Read the update here: Harvest Moon: Light of Hope SE: The Details of the Doc's and Melanie's Special Episodes. That's all we know so far about how to change clothes in Harvest Moon: Light of Hope. I hope you guys happy with the availability of this feature, better than nothing, right?